This synagogue once stood in Horb, a small market town near Bamberg in southern Germany. Built at the beginning of the 18th century, it was used by the Jewish community of the town and outlying rural areas. | The synagogue originally occupied the second storey of a small wooden building. Its Torah ark was set in a niche on the eastern wall, the bimah (reader’s platform) was located in the center of the room, and benches were arranged along the walls. The women’s section consisted of a small room adjacent to the northern wall; the women entered through a wooden door and were able to see into the main hall through a grill in a horizontal opening in the wall. 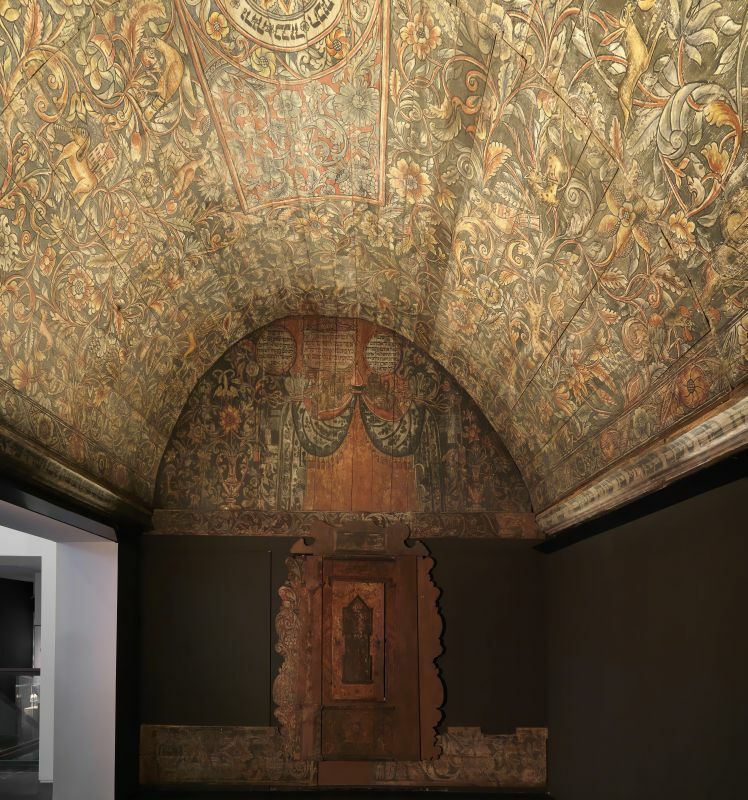 | Originally, the walls as well as the ceiling were plastered and completely covered with paintings and inscriptions. Unfortunately, very little remains of the wall decorations. The paintings date from 1735 and are the work of Eliezer Sussman, a well-known Galician Jewish artist who specialized in synagogue decoration. Sussman is known to have decorated four other synagogues, all in Bavaria. The Horb painted ceiling remains as the only surviving evidence of the tradition of painted wooden synagogues in this region. | After 1864 the synagogue became a barn where hay was stored. In 1908 its original function was rediscovered by chance, thanks to the paintings. In 1913 what was left of the synagogue was moved for safekeeping to the Bamberg Museum of Art, and in 1968 transferred to the Israel Museum by the Bamberg municipality.